Playing a “serious” gig on an unfamiliar instrument… insight and connection! Great weekend – I played a wedding gig at Beaumont Estate in Windsor: and it got me thinking about my style of bass playing, and the way I tend to play at the moment (I’m playing a lot of open mic nights, covers of funk and soul stuff in the main). The setlist was in two parts – the second being the reception, your classic wedding gig. But the first half was something else: playing around the actual ceremony – I’ve never done this before. Bird did a great job of pulling rehearsals together, including smaller ones for this “acoustic” set – no drums, but a little percussion. The setlist was a nice little collection of songs to cover the initial wait for the bride, then a song to play as the bride comes in – I had no idea what this would feel like – and a couple more tracks to play while the register was signed and the cake was cut. So – a great little gig with something completely different! Somewhere Only We Know – for the register signing. This is the Lilly Allen cover, which is really stripped back and quiet, but pretty. 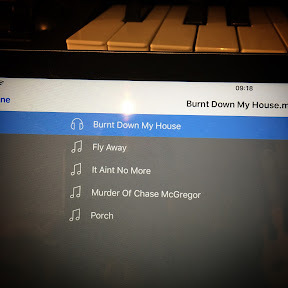 The night before the gig, I was looking at the tracks and wondering – could I play these in a more sympathetic way? The electric bass can be sophisticated, and quiet, but… what about double bass? The evening before the gig I tried a few ideas out: the tracks aren’t too tricky – ordinary people has a nice simple structure, I know can’t take my eyes off you really well from previous gigs. After maybe half an hour of practice, “At Last” started to sound the part – that track in particular really benefits from double bass, it makes the track swing and jazzes it up in a way the electric can’t. Simple controls – volume, tone and the toggle switch to switch the pickups between fingerstyle and bowed use. If you try fingerstyle while it’s in bowed, you get a lot of attack but no sustain – the pickups align their sensitivity somehow, I suspect they may have 2 sets mounted in there at different points on the bridge. On the day, the guys in the band were blown away by the difference it made to the set – I was really pleased with the result: it felt so much more sophisticated for the happy couple, who, of course looked amazing. Stretch yourself out there. Comfort zones can be breached – but make sure it’s going to work first! Basses: a wealth of styles, technologies, sounds and shapes. 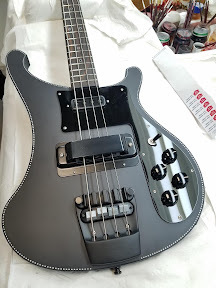 I saw a picture this morning of a black Rickenbacker bass - even the hardware was black: I've always thought of the Ricky as a rather traditional bass - it certainly has a retro look about it, and the sound is notoriously unique, with the middle-focussed growl of it suited better to certain styles of music (Rush and Motörhead come to mind initially). Here's a regular Rickenbacker: certainly beautiful, and highly distinctive with the scrolls and that headstock. And here's the black one I saw this morning, complete with black pickup cover: there are a lot of extra elements included here, including that binding around the edge of the body. It transforms the rather retro look into something more contemporary, somehow - the Matt black paint job is great. This got me musing that one of the things I love about being a bassist (apart from the chance to weave a bubbling line between an excellent drummer and an infectious melody, thereby being the glue which holds songs together) is the sheer wonderful variety of basses out there. I'm lucky enough to own a number of basses, and initially any acquisitions I made were driven by some pragmatism about extending the range of sounds I could make - so I started with a 4-string fretted bass (a PJ as I recall, moved on to a slightly better 4-string, then got a 5-string (and loved the extended low end it has) - after a long pause I then got a 6-string (the Tobias pro-6 I had completely overhauled and upgraded with OBP-3 and GK-3B pickup fitted into it a couple of years back). All these basses were fretted - I had built a 4-string fretless (which wasn't a huge success) using the body of the first bass, but I eventually bought a 5-string fretless (a Warwick, which looks and sounds amazing). These were all sonic decisions - Warwicks also have a sound which is marmite to a lot of people. That's a stunning piece of work. Basses seem to attract the kind of exotic wood luthiers dream of - I know there are exotic guitars out there, but basses just seem to offer up a wider vista of experimentation which luthiers get to let their imagination run wild with. Some video of ME!! Actually playing bass! I posted recently about how putting myself out there for the Reading jam nights at the Butler last year has transformed my musical life: it's been another resurrection. Last night's jam was excellent, and there was a fellow there with a pretty hot SLR camera shooting video, and the mic on it is excellent. Check this out, and I've got a SOLO at 5:28!! I'd say I have a project to finish... #blog #bitsabass Seymour Duncan quarter pounders, ebony fretless neck, Schaller tuners, and full fender pickup cover set. It'll be a beauty and sound good with any luck! Well now. Resurrection was always intended as a blog detailing how you can regain faith in musicians and making music with others. And the gig I've just got at the weekend is a great example of how it can happen. You just have to put yourself out there, literally and figuratively. These guys make some great classic blues - the vocalists (Liam Barnes and Heather Leoni) have the perfect voices for the job. And they both happen to be people who come down to the jam nights in Reading which I decided to start visiting last summer. What a year it's been since then - I play more music now than ever: I'm truly grateful to everybody who I've met and had the pleasure to create some noises with. A lot of great pictures are stored in the iCloud of my head! 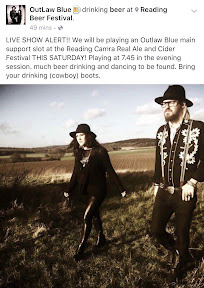 So this Saturday, check out the beer festival in Caversham - it's a great event anyway, but Outlaw's music is beer festival gold, suitable! We're on around 7:45pm through to 8:45. The only requirement is to be a hoopin' and a hollerin' like an ole boy. Stomp like you ain't got your shoes fixed! Also, I get some Rhythm section time in with the excellent Rob McGregor again. Sweetness! Muso DIY - show your Bass some love! I've had a good couple of weeks for long-standing jobs on basses which I've put off for a long time: First, I fixed up the Crafter BA-400 acoustic bass using new brass sting pegs and a new nut from Strings Unlimited - this bass is well built, but basically all the hardware on it was awful: I've replaced the tuners with Warwick ones (in the original silver, natch), and now I've replaced the string retaining pegs with brass "Pinz" (nice mother of pearl tops), and the nut: anything original which held the strings apart from the bridge (hope that holds) has decided to crap out. Additionally my fretless has had a buzz at the 9th fret for a long time - I know fretless are meant to buzz, but this was an unpleasant out of character "rasp". I've spent maybe half an hour on the fretboard with 400 and 600 wet and dry paper, flattening out the dead spot, and it's worked! Just used the excellent fretboard oil I got from Rikkers and the ebony board has gone a beautiful shade of near-black. Now all I have left to fix is the "bitsa" fretless I'm building with the rather pretty sunburst jazz body and my "Basexperience" neck - this has full on silver bridge and pickup covers, so when it's put together it'll look suitably retro. The body is fully loaded already and I haven't heard the pickups yet: it was an eBay bargain! Good times at gigs and open mic nights recently: the Butler jam night last Tuesday was excellent - nearly 4 straight hours with 4 excellent drummers, great keyboards and some pure jam as well as some tracks we don't normally do. Brand new experience: looper with live band... And it worked! Last night's jam at YATES'S in Reading was fun, if a little quiet - we used the time to run through the Shaydes set, and I got to do something with the GR55 synth - live - which I never thought would work. Fairly simple but groovalicious bassline, nailed the built-in looper on it while Demetrius was playing, he held tempo and it worked, so I started playing Rhodes Piano on the Tobias(!!) and it sounded EXCELLENT! All this through the new 2x10 markbass traveller: quite a feat for that little cab. I'll be trying that again! Time for some bass repair work - my Crafter BA-400 electro acoustic bass (nice piece of kit, handy for parties!) needs a new nut and new pins. Nice brass mother of pearl inlaid pins! Better than the god awful plastic things it came with, one of which has snapped! Look forward to restringing with some nice lightweight strings for chilled summer evening jams with friends. I may even get a battery amp!! It's loud enough with a pick though. I've become... attached to some excellent musos in Reading: the Butler Thursday night jam sessions are great - particularly when Champion Be comes along and fills the pub with keyboardly goodness - and now there's a new one as well: YATES'S pub in Reading, every second Tuesday. Should be fun - it's a big venue, good stage area, and great bar: roomy feel, space to jump around a bit! I'll have the chance to try out some gear tonight in a live situation which I haven't yet: should have some good power and lots of tones on hand. Just like Lemmy, this was an artist who did things on his own terms (most of the time!) - something of an innovator, with an inscrutable talent which came from a background of "whole-art" performance, as it were. The music industry (such as it is!) doesn't have space to identify, nurture and promote this kind of Maverick any more (and hasn't for some time). That's something to be mourned. Not so much that Bowie is gone - he's left behind decades of thought-provoking and interesting music, so we'll always have his emotional output, his essential humanity to listen to and think about, which is an epic legacy - no, no that he's gone, but that we now live in a world where music is so disposable, so instant, so cheap, that investment in an auteur is a non-starter. Maybe Kickstarter might have something after all - if Bowie started today, would be develop a local following for his off-the-wall stuff, then launch a Kickstarter to do something bigger and manager his own entire career, living off nothing but YouTube ad revenues, pitiful streaming residuals and merchandise? And if he did, would he have time to actually be an artist at all? I live in interesting times, and it's good. Around June last year, I resolved to get engaged with live music around Berkshire and Bucks a bit more. I did the website thing, looked at Muso sites and had a couple of bites: but, as they say, there's no substitute for pressing the flesh. Tony Tomlin is an excellent fellow; he runs phat tone studios (http://www.phattone.co.uk) and he an I have collaborated on stuff in the past, and gigged a fair amount. Via him, I found out about a songwriter/vocalist named Marisa Rodriguez: I checked her on SoundCloud and thought her stuff was excellent, and very different from what I'd played in the recent past to that point. I found out she was running an open mic night at the Butler in Reading (https://www.facebook.com/Picnmix-Jam-Night-1625485404332208/), and thought I'd check it out. I hadn't done open mic nights in a long, long time. A lot of jam nights are worthy affairs - but tend to have somewhat restricted set lists - the kind of music which was popular in pubs 10-30 years ago: guitar-based Rock. Good crowd pleasing stuff, but if you do it week after week, it can get tiring. The Pick n Mix was a revelation. As was Marisa. It turned out she was a hyperactive, ultra-friendly, musically-connected machine: the musicians who came to the jam night were about as eclectic as you could get. So many good drummers. Percussionists. Sax players. Guitarists. Songwriters who genuinely turn up to play their own material. And freestyle guys with genuinely professional flow: I got to back some serious rhyme, and I LOVED it. Marisa pulled together some musicians for the Marvellous festival 2015 in August; and I was pretty stoked to be asked to join her. We rehearsed - a lot - and by the time the gig came around we sounded great. Huge band, huge sound. After some rearrangements of lineup, Marisa had pulled together something a little more permanent, and I'm proud to be part of it. Last night we played what I think was our most intense gig: the beats laid down by Demetrius were stone for my low end to wrap around: James's guitar solos were beautiful: Marisa's voice transcended the venue: And David's keys gave us the extra dimension which pushes the music into the dense, layered and dynamic sound I am coming to love. It's been a hell of a journey since last June. I've always held on to the idea that those who say that "the last year has just flown by" just aren't DOING enough. I always hope that I can look back on a year, and wonder how the hell there are so many memories in it. This last year had been absolutely stuffed. It's full. It can't eat any more experiences or it's going to burst. No, seriously, it can't have a wafer-thin mint of gig. And the ongoing musical interest that is Shaydes (www.shaydes.co.uk - still in progress! - and https://www.facebook.com/shaydesofficial/ - now heading for 500 likes since we put out our first single in December 2015) is an excellent antidote to wondering where the hell your year went. When you know good people, and their energy and enthusiasm, their musical talent, prowess and sheer will to make great music, plus their empathy for the music's dynamics means that you just love the onstage feel - and the music is original material - this is something I've wanted for more than a decade (since Janeiro / Tempa Tempa in 2005!). It's going to be a great 2016. If we have more gigs like last night's, it's going to be epic. A Bass Cover Video? Me? Why yes. Yes, I'll finally do one. Anyone who knows me will know I've played "midnight" by Joe Satriani on Bass for a long time. Today I finally recorded a version, and videoed the result, as an experiment: the video was shot on an iPhone and the audio was recorded through my gear. The performance has a couple of fluffs, but it flows well enough to show, I think. I'm a little beyond spending 7 days to achieve perfection! This was done in about 45 mins, including mixing and video editing.